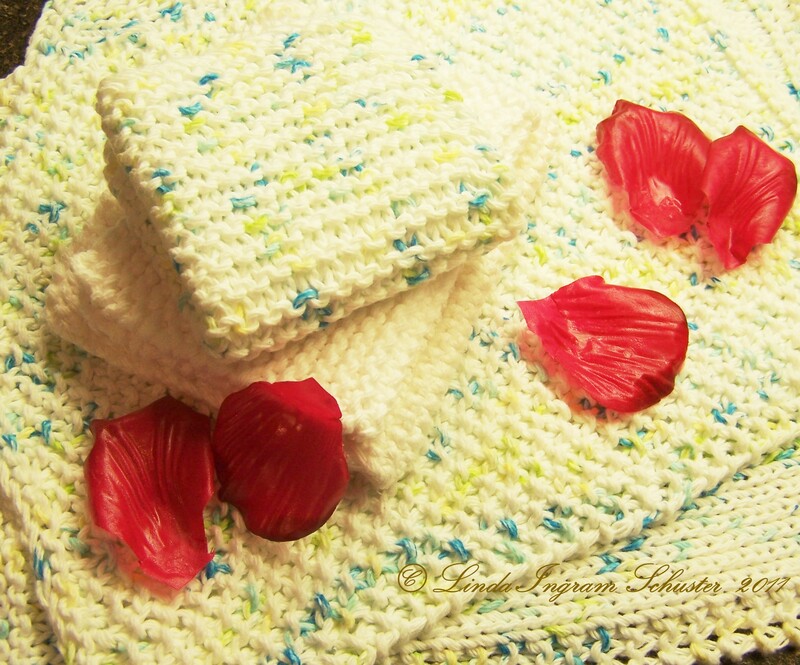 Posted on October 21, 2011	by Linda S.
After I made the rose petal soap not long ago, I found myself using one of my larger face cloths for a fingertip towel to dry my face… It felt so much better than a terry towel that I immediately found myself knitting some more. I’ve tried several different patterns, but I personally like the feel of a plain garter stitch or moss stitch better than any of the fancy stitches. I used Peaches and Cream Cotton Yarn and size 8 needles. The pattern is worked back and forth so either straight or circular needles can be used… Gauge is not important. Cast on 40 stitches using any cast on you would like. Row 1. Slipping the first stitch of every row, knit across all 40 stitches. Row 3. Repeat Row 1 until you have your towel as long as you would like. Mine are about 14 to 16 inches long. The Moss Stitch Pattern consists of the knit and the purl stitch..
For this one I used the samePeaches and Cream Cotton Yarn. I used size 8 knitting needles as before. Cast on 41 stitches in any cast on you like to use. Row 1: Knit 1, purl 1 across row ending with a knit 1. Continue repeating row 1 until your towel is as long as you like. We are finally getting to use our new fireplace at least for a little while each day and I love that.. This entry was posted in Crafts, Free Patterns, Handcraft, Handwork, Knit and tagged cotton, Free Patterns, Knit, yarn. Bookmark the permalink. I love these, I also knit, and I was looking for fun and easy projects to do! Great post!